If you follow me on Instagram at all, you will have most definitely saw my mini moans (not so mini) about Patricks terrible time sleeping last month, after always having a baby that slept through it was a shock to the system. Thankfully he seems to have worked it all out by himself, and I feel like I have my baby back, tough sleepless nights were making for both a grumpy me and a cranky baby which really was no fun at all. I'm not sure whether it was teething, the move into his own bedroom, colder nights or just a mix of them all together, maybe he was just being a bit of a sod, I really don't know. But something that was always suggested by people from my friends to my family, was 'Why don't you just bring him in with you?' and while I'm sure it would have kept him sleeping through, it's something I vehemently did not want to do. Co-sleeping, just isn't for us. 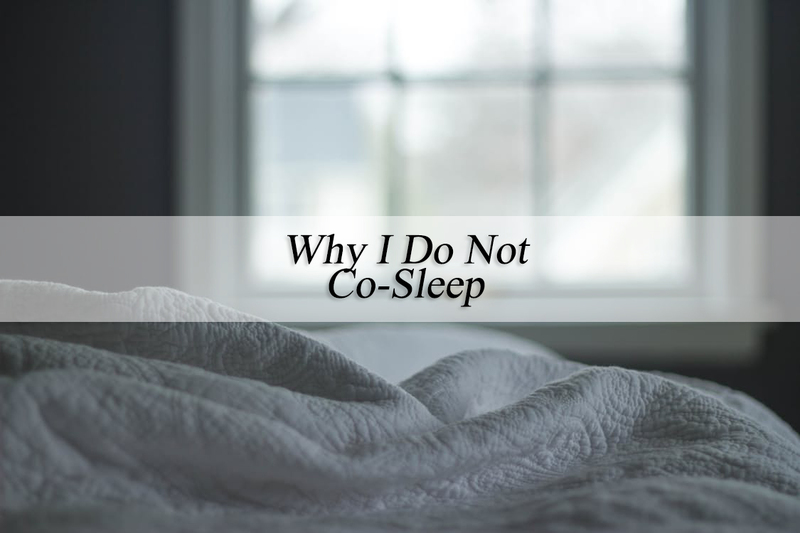 Co-sleeping is a topic I can most definitely talk and give my opinion or judgement on, because I've been there. I have been the Mum at 5am that just willed her baby to sleep for one more hour, so brought him into our bed and felt utter relief when he dropped off. But I've also been the Mum that experienced months down the line that her baby slowly but surely managed to get into her bed earlier and earlier every single night - and I don't want to be that Mum again. When Noah was a baby, though he wasn't a terrible sleeper, he wasn't exactly great either, we'd spend sometimes over an hour rocking him to sleep for him to wake minutes later and the cycle begin again, often our whole evenings were taken with getting him down. Even when we cracked that, thanks to bronchitis it all got disrupted and we had several wake ups every single night, it was tough and thankfully when he was around 9 or 10 months and moved into his own bedroom, things got better and we all felt that bit more human. Noah would often wake at 5 and I'd bring him in with us, till we all woke around 6:30, then before I knew it he was waking at 4, then 3, then 2, and before long he was spending most of our nights sleep in with us. People have a perception of co-sleeping as snugly, loving and peaceful but for me it was more uncomfortable, disruptive and worrying. I never slept properly as I always cradled him in my arms scared to let him free for the risk of a covers-over-head situation, which also meant I rarely slept with covers on me at all. Noah was no tiny boy, my arms through to my shoulder blades would ache, and even in a huge kingsize bed there just wasn't enough room for us all to be comfortable. So, swap that now for our mere double bed, there definitely isn't enough room for comfort and safety. So, now it comes to Patrick. Aside from knowing that co-sleeping wasn't comfortable for us, I was more than aware that the risk of SIDS is hugely increased when you co-sleep, and only when I actually looked into it did I see that in fact the statistic is 5X as likely, that was enough to completely terrify me. Given that Patrick already had some check boxes next to things that increased his risk, such as the fact he was a boy and premature, I really didn't want to chance anything and add something else to the list. Of course there are so many ways to safely co-sleep but none of them reduce that risk of SIDS and I just truly couldn't cope if I'd chosen that route and the worst happened. I was so keen with Patrick to get him into a good sleep routine from the start, he slept through from five weeks and he's pretty good at self settling now, I didn't want to mess up so much hard work and perseverance by just chucking him in with us when we hit a rough patch, how could I expect him to suddenly go back to his own bed with ease and his old routine if I'd chosen to disturb it so drastically. I'm thankful I've pushed through our little bump in the road (again, not so little) and everything seems to be back how it once was, I know that although bringing him in to co-sleep might have fixed a short term problem it most definitely would have created a longer term issue, I speak from experience with Noah. Quite recently when discussing the issue with a friend, she explained to me that co-sleeping can increase a better bond, I had to giggle a little, nothing could strengthen my bond with my boys, I love Noah as much as I love Patrick and we've had two totally different sleeping situations with them, I think it would be crazy to insinuate that being closer to someone strengthens a bond. Wives have husbands who work in the military, no way would I think my bond with John is stronger as he is home every evening. I don't think love works like that. Though I do think I'm more likely to be more excited for the day with my baby if I'm not waking with aches, pains and dead arms every morning. So there you have it, my reasoning and story why we don't co-sleep. A little disclaimer as you always have to be careful when discussing parenting techniques and what works for you, just because I don't feel comfortable co-sleeping, certainly doesn't mean I frown upon others doing it. I've been there, I've worn the t-shirt myself and I can only speak from my experience, I know so many who've managed to co-sleep well and had no issues and if it works for you that is great. But unfortunately, co-sleeping just doesn't work for us. You are wrong. Completely wrong. The risk of SIDS actually DECREASES when co-sleeping correctly and safely. Do your research properly before scare mongering and slamming something that you clearly know nothing about. I'm sorry you feel that way. This most is merely to give my reasoning for why we don't co-sleep. However, I am indeed correct. We were briefed thoroughly by neonatal doctors about the increased risks of SIDS when co-sleeping, and such information can be found on almost any child health website. The risk certainly doesn't decrease and to suggest so would be incredibly misleading. My daughter was also premature and no way we were co-sleeping. More to do with the fact that I may roll over onto her! I'm not anti co-sleeping however it's not something I would chose to do. That said, I have been so sleep deprived that at times I can completely appreciate why people are tempted!! We never coslept with N when he was a baby. For starters, the OH wakes at 5am for work so he'd not have got enough sleep and neither would I, plus with a baby I'd be too scared as well as wanting him to learn to sleep in his own bed. But now the OH tends to head off to the spare room because he says I snore, so there's plenty of room. I don't encourage it, but N went through a phase at around 3.5years when he would climb in with me. I'm a deep sleeper so never realised to kick him out again. If the OH finds him there, he kicks him back into his own bed, but he's too heavy for me to lift out. Now I find that he tends to come in when he's not feeling too well. Or after going on holiday where he's been used to sharing a room with me. I think it's for everyone to decide what's right for them.